Deborah Gelisi wiped the tears from her face, took a deep breath, and continued with her presentation on the importance of sustainability for Italian wine producers. It wasn’t an easy thing to do. Deborah’s audience was in tears, too. Her classmates and teachers at the Scuola Enologica di Conegliano. Her winegrower parents. Even her 12-year old brother, the fearless goalkeeper of his youth soccer team. Over at the head table the city’s mayor was misty, the school’s director was teary, Rai Uno journalist Camilla Nata was a little choked up, and I was a pretty emotional myself. There wasn’t a dry eye in the house. Stories about rooms full tearful people don’t usually feature on The Wine Economist, so you probably have some questions about what was going on and how this relates to this column’s optimistic title. I’ll try to answer the questions one by one. Deborah Gelisi is an 18 year old student at the Conegliano Wine School, which is Italy’s oldest enology and viticulture school and, according to our friend Paul Wagner, probably the largest wine school in the world. Founded by Antonio Carpenè in 1876, it provides education and training for young students who have chosen to work in the wine industry. The school has a long list of distinguished alumni including notable Romeo Bragato, who was instrumental in the development of wine industries in Australia and New Zealand in the 19th Century. Deborah comes from a wine-growing family. She gets up early each day to work at Podere Gelisi Antonio, then takes the train from Pordenone to Conegliano for classes, reversing the commute in the afternoon for more work and, of course, study. I don’t know when she sleeps. Why Was Everyone Crying? Bad news? Deborah was being honored as the first recipient of the “Etilia Carpenè Larivera International Scholarship,“ which will provide her with the opportunity to expand and deepen her wine knowledge through international travel and study and jump-start her career in wine. The scholarship was inaugurated this year to mark the 150th anniversary of the founding of Carpenè Malvolti, one of Italy’s most distinguished wine producers. Its founder, Antonio Carpenè was the inventor of the process of secondary fermentation in autoclaves that gives us Prosecco. Carpenè Malvolti honors its past in many ways, which you will discover if you spend some time at the new visitor center in Conegliano, but as a family wine business it is all about building for future generations. That’s why the photo above shows Deborah with Rosann Carpenè Larivera, the fifth generation of the famous family, along with her daughter Etilla, the rising sixth generation, for whom the scholarship is named. What’s the Significance of the Award? It is good to honor students and to provide valuable educational opportunities, of course, but it is important to see this award in broader context. Deborah’s award was part of a project called Generazione DOCG, which aims to invest in the future of the region through its young people. Everyone was crying (and then celebrating) because this isn’t an ending but a beginning, both for Deborah and for the region. The next generation of Italian wine producers will face many challenges, as we discussed at the VinoVIP meetings in Forte dei Marmi in June. The industry is fragmented, lacking the strong brands that could build help open markets and build margins. It won’t be easy to make progress given intense competition everywhere. But there is real hope. Rising wine professionals like Deborah Gelisi and her student colleagues can make a difference in the vineyards, cellars, and markets. If Deborah is an indication, they have the knowledge, drive, determination, and entrepreneurial spirit that will be needed. And they have the backing of their families, communities, and forward-looking wine firms such as Carpenè Malvolti. With this team supporting and encouraging them, it is easy to see that the future of Italian wine is in good hands. Congratulations to Deborah Gelisi. Special thanks to Carpenè Malvolti for inviting me to speak at this awards ceremony. It was an honor and a pleasure. At the end of my review of To Cork or Not to Cork, George Taber’s informative 2007 survey of the wine bottle closure wars, I vented some frustration. Not with the book, which is great, but with the closures themselves. Taber taught me that no wine bottle closure was perfect, although he had high hopes that competition among closure producers would make the future brighter. Here’s the conclusion of my 2007 column. I think Taber is right, but for now I’m just standing here in the basement, looking with suspicion at the wine in my little cellar, trying to guess what is going on beneath the lids. Having read Taber’s book, I now know enough to be anxious about each and every bottle! Eight years have passed and the closure wars continue. Perhaps the single most-asked question when I speak to consumer groups is about what’s at the top of the bottle, not the contents. “What do you think of screw-caps?” Well, what should I think? Jane Firstenfeld’s Wines & Vines article “Unconventional Toppers for Top-Shelf Wines” takes the form of a series of brief interviews with premium winemakers who report their use of screw-cap closures (including Van Duzer, Chehalem, Meoimi, Silverado and Sonoma-Cutrer) or synthetic closures (Schug and Eberle). 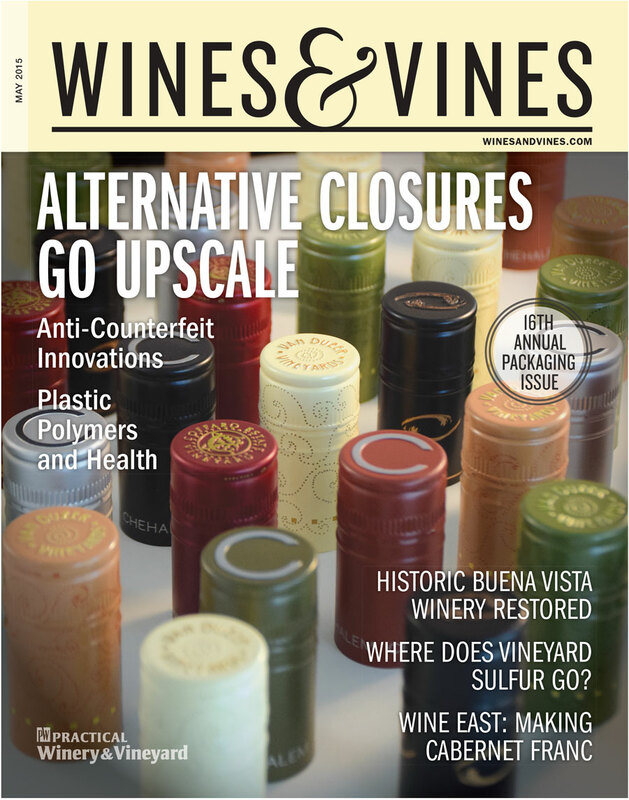 The article gives a sense of the great variety of alternative closures available (gone are the days of one-size fits all) and the research and trials necessary to assure the best possible fit between wine, winemaker and closure. It’s a good piece of reporting if you have a dog in this fight! Natural Cork is #1. So are Synthetic Closures. Discuss. Curtis Phillips presents the results of the Wine Business Monthly survey of winery closure use in his article “Natural Closures Rated Highest.” One colorful graph caught my eye — it showed the results of the survey for five years where respondents were asked which closures they used for their $14-$25 red wines? Options (more than one choice allowed) started with natural cork and moved on to technical cork, synthetic closures, screw caps and an “other,” category that includes Zork and Vino-Seal. The graph suggests that natural cork is used by about 50% of the wineries surveyed, down from nearly 70% a few years ago. Technical cork is shown rising from about 20% to 30%, while ynthetic closures are roughly stable at a little more than 10% and screw caps are shown rising from about 10% to 30%. The devil is in the details in surveys like this and to their credit WBM provides details that clarify the picture. The unit of analysis for the survey is the winery whether it is big or small, which changes up the conclusions you might otherwise draw. Many more wineries use natural cork, but many more bottles of wine here in the U.S. are sealed by synthetic closures. The 10% of wineries that use the synthetics such as Nomacorc include some boutiques (Oregon’s Ken Wright Cellars, for example) and some giants (Gallo), so that about half of all wine bottled in the U.S. comes with a synthetic closure even though only about 10% of wineries surveyed use it. There is more to the WBM story than this, of course. Winery respondents were asked to give their ratings of closure alternatives and the result is a rising tide — all of the closures were rated higher than they were a few years ago. When it comes to quality in wine closures, the trend seems to be up and up. This did not surprise me because closure manufacturers keep me well-supplied with press releases about their newest innovations and I have been impressed with the way that they have responded to criticisms and invested in improved technology giving wineries higher quality and greater choice. There has also been something of a shakeout taking place over the years, with some producers dropping out of the market, increasing the scale of the others, which further increases the return to new investment. The race to the top is true for natural cork, as Antonio Amorim and Carlos de Jesus made sure I appreciated when I met with them in Porto last year. Natural cork producers made a terrible mistake when they did not recognize problems in past years, and they paid a high price in lost market share as a result, Amorim told me. But better consistency, higher technical quality and strong consumer acceptance makes natural cork a competitor in every market, he said. And of course better natural corks force the other closure makers to raise their game, too. Winemakers and wine consumers certainly gain. If there’s one area where cork closures would seem to have an unavoidable disadvantage over screw-caps, however, it would be convenience. Screw caps are just easier to handle and, with rising technical quality, that would seem to give it a big advantage in some markets at least. Even wine guru Hugh Johnson thinks so. His May 2015 column in Decanter magazine proclaimed that “I am faintly irritated now when I come to open a bottle of wine and find I need a corkscrew.” Gosh! The screw-cap is “incomparably better” than natural cork, he says. Do the Twist — Like This! Well, Amorim doesn’t want to lose Hugh Johnson’s business (or anyone else’s) so last year they released a screw-cork closure called Helix. That’s right — screw-cork (see the image above). 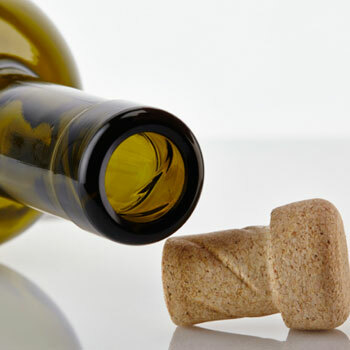 The cork and specially-made bottle are designed so that the cork screws into (and out of) the bottle slick as can be. Screw-cork? Amazing.Probably not as important in the grand scheme of things as the technical improvements in cork production at Amorim, but still a great example of how innovation occurs even in centuries-old industries like cork closures. Is this an example of Taber’s idea that unfettered competition is a driving force for for good? When it comes to closures, it sure seems to be true. Here’s to the race to the top! The new issue of the Journal of Wine Economics (JWE) leads off with a fascinating article by Julian M. Alston, Kate B. Fuller, James T. Lapsley and George Soleas titled “Too Much of a Good Thing? Causes and Consequences of Increases in Sugar Content of California Wine Grapes.” It’s the kind of wine economics research that makes me smile: rigorous, clever, relevant — and it even includes a poem! What could be better! The puzzle that the article examines is why sugar levels (measured in degrees Brix) have risen in California, taking wine alcohol levels with them. Sugar levels in white grapes grown in California increased 12% from 1980-84 to 2005-08, for example, with the average degree Brix rising from 20.7 to 23.2. Average Brix for red grape varieties increased from 22.2 degrees Brix to 24.3. Sugar levels in Cabernet Sauvignon grapes increased from 22.8 to 25.0 degrees Brix at harvest. Higher sugar levels mean higher alcohol levels, all else being equal. Two simple explanations are usually cited to explain the rising sugar/alcohol trend. The first is based on changes in demand. 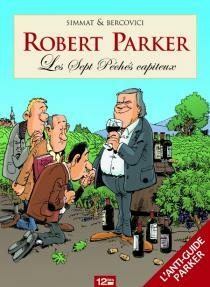 Robert Parker (and some other powerful wine critics) are said to prefer a certain style of wine that is riper. Sugar and alcohol levels have increased as wine growers have worked to produce the grapes that make the wines that most please the Golden Palate of Robert P. (or that otherwise appeal to changing consumer preferences). I call the second theory the “Chateau Al Gore” hypothesis because Al Gore is associated in popular culture with global climate change and that’s what this theory is about. Rising temperatures, according to this line of reasoning, produce riper grapes pushing up sugar levels, boosting alcohol. It is pretty easy to line up facts to make a persuasive case for Chateau Al Gore. Temperatures as measured by a heat index have been rising in California, according to the article’s authors. Sugar and alcohol levels have increased, too. Although additional sugar may be welcome (the Parker principle), there are indications that producers would prefer lower levels. A good deal of wine in California is partially de-alcoholized, for example. Alcohol is removed from a portion of the vintage (using reverse osmosis or the spinning cone method I am told) and then the treated wine is blended back, reducing overall alcohol levels and allowing winemakers the opportunity to find the “sweet spot” alcohol level for their wines. Some of the de-alcoholization may be motivated by federal taxes, which increase substantially on a per-gallon basis for wines that rise above the 14% ABV level. The extra 50 cents tax per gallon may not concern the makers of expensive wines like Screaming Eagle, but it can be a significant cost factor for bulk producters and thus worth the expense of alcohol reduction. In any case, the authors find that lower-priced grapes tend to have lower average Brix readings, which is consistent with the tax hypothesis but doesn’t prove it. If alcohol levels of wine have increased even after partial dealcoholization, this suggests that rising sugar levels must be unwanted and this notion is at least partially confirmed by preliminary data reported here that many wineries under-estimate alcohol levels on product labels. The authors have obtained access to data from the Liquor Control Board of Ontario (one of the largest wine merchants in the world), which show that the average stated alcohol level of California wine exported to Ontario was 12.63 percent in the sample period while the actual level was 13.35 percent. The gap is clear, but the authors suggest that more work is needed to fully understand it. I’ll be interested to read their final report. The Chateau Al Gore theory seems pretty persuasive. Ceteris paribus (holding everything else constant) it makes sense that sugar and alcohol levels would rise with average vineyard temperature. The fact that winemakers work to offset the alcohol boost and maybe fudge it a bit (within legal limits) on the label suggests that this is a climate change event that they struggle to contain. But ceteris is seldom really paribus in wine. Employing multi-factor regression analysis, the authors find that the rising heat index is responsible for some of the increase in sugar levels, but not all of it. Put another way, climate factors alone are not sufficient to explain the total increase in sugar and alcohol. Other factors must also be at work. Which pushes us back to the demand-side Parker Theory, but in a usefully complicated way. It is important to understand how much the California wine industry has changed in the last 30 years. The type of wine produced has changed, for example, with varietal wine (Chardonnay, Cabernet Sauvignon) increasing faster than production of generic wine (“Chablis,” “Burgundy”). Varietal wines accounted for 71% of California production in 2000, according to the authors, compared to just 19% in 1985. The move upmarket required different grape varieties of higher quality from different production zones. Thus while total California wine grape production rose by 60% in the survey period, the biggest increase (+185%) was in the Delta region (including the Lodi AVA) with the North Coast (including Napa and Sonoma Valleys) increasing by 128%. Wine grape production in the San Joaquin Valley rose but by a much smaller amount. The southern San Joaquin valley accounted for just 30% of California vineyard acreage in 2008 (down from 50% in 1981), although it still produced more than 60% of wine grape tonnage because of higher yields. So wine grape production has increased and also shifted in terms of desired quality, price per ton, grape variety and growing location. It is perhaps not surprising that average sugar levels would change too. Much of the growth in the California wine industry has thus been associated with the demand shift towards premium and ultra-premium wines and the rising sugar levels are to some extent associated with this “grape transformation” of the American palate. Robert Parker is part of this movement although I think it would be unfair to give him all the credit or blame for the changes noted here. So the JWE article finds evidence for both the demand-side and supply-side theories of rising sugar levels. But wait, there is more, including rootstocks (this is the “real dirt” in the title of this post). Phylloxera struck California starting in the mid-1980s when the supposedly Phylloxera resistant AxR#1 rootstock was found to be susceptible to this root-sucking parasite. Eventually nearly all the vines affected were grubbed up and replaced with vines grafted to different (and hopefully more resistant) rootstocks. Several winemakers have suggested to me that the new rootstocks and associated changes in viticultural practices affect grape ripening — sugar levels peak before the desired flavor profile (phenolic ripeness) has been achieved. Longer hang times are needed to get the flavors right, leaving wine growers with the problem of too much sugar and so forth. The rootstock hypothesis is beyond the scope of the JWE study, but it indicates how complicated it can be to explain seemingly simple questions in wine economics and how much wine remains an agricultural product after all. I don’t think I’ve done justice to this research so I hope you will click on the link in the first paragraph above and read the study yourself. Alfred Marshall defined economics as the study of people as they go about the ordinary business of life. People who love wine believe that it is special and they are right to a certain extent, but it is also ordinary at least in terms of some of the business functions. Herewith the first of two posts about how ordinary and extraordinary intersect in the wine business. Information technology (the bits and bytes of the title) has insinuated itself into almost every aspect of our daily lives — why should wine (the sniff and swirl) be any different? And indeed it is not, although most of us probably romantically wish it were otherwise. The most obvious place where IT comes into play is in the marketing of wine. Most winemakers today try to use social media vectors such as FaceBook and Twitter to establish and nurture relationships with customers. I’ve read that the hard sell approach isn’t generally effective (readers: use the comments section below to share your experiences with this), so the focus is on soft sell. But is it worth it? That’s the business question. Yes, it is probably a mistake to ignore social media entirely (just as you would be crazy not to have a winery website or a website for your barber shop if that’s your business), but what’s the smart level of investment? After all, social media doesn’t create and manage itself. Someone’s got to represent the winery as host, posting content and responding to friends and followers. How much investment makes sense? One big time winemaker friend put it this way. Which is better for the winery — a full time employee to manage social media or three full page advertisements in Wine Spectator? Wow, that’s a tough one, especially since the audiences and the nature of the impact are so different. But, from a business standpoint, that’s the sort of trade-off that must be evaluated. It’s the same thing for QR codes. 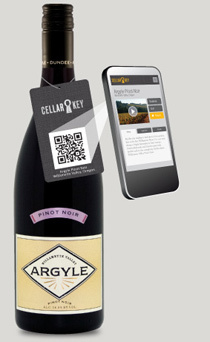 Wineries can use QR codes to enrich their story-telling to smart phone-enabled customers, which is surely an advantage, but not without some investment. The old marginal cost versus marginal revenue questions will always be there, even in the wine game. Trend Micro sent me information about their SafeSync for Business cloud data system. It provides a safe, secure data storage system. What got my attention is that they featured a winery case study: Good Harbor Vineyards on Michigan’s Leelanau Pennisula. “As a wine maker, we are highly monitored and regularly audited by numerous government agencies. We have to keep track of everything—every bottle and every ounce has to be accounted for—from purchase through production, bottling, sale, and shipment. We were worried that someone could gain access to these records. Losing our files would be crippling in any type of audit — and these take place frequently. This made me realize that wineries have all the business IT needs that other types of firms do, and a few more as well. I think it is interesting that a big firm like Trend Micro would make a point to feature winery applications. I wonder if small and medium sized wineries (like similar businesses generally) have lagged behind the IT cutting edge and are therefore a ripe market for upgrades. Or maybe wine is just the sort of example that makes everyone realize how important data can be. While some parts of the wine business are not so different from any other business (with a couple of special wrinkles in the cloth just to keep things interesting), some business needs really are fairly specific to wine. Every business needs to be able to track shipments and inventory, for example, but wine’s needs often go beyond the norm. A London to Hong Kong shipment record. The wine business is large enough to spawn IT applicantions to meet its particular specialized needs. For example, a company called eProvenance has been formed to provide reliable detailed information about wine shipping conditions. Wine buyers, especially those at the high end of the market, now seek assurance of the quality and authenticity of their investments and their concerns extend all the way through the supply chain. A Bordeaux to Beijing shipment record. Your bottle of Chateau Margaux (lucky you!) won’t be the same if it has been “cooked” in an improperly handled shipping container, for example. But how can you be sure it hasn’t been? Enter the NFC temperature sensor! Boston, Massachusetts – December 6, 2011 – eProvenance, a Franco‐American company applying advanced technology to monitor the temperature of fine wines as they travel from wine producer to customer, has developed temperature sensors that are compatible with the Near Field Communication (NFC) protocol and can be read through wooden cases of wine. Using the NFC protocol, which makes it easy to communicate data via smartphones (like the Google Nexus S), the new eProvenance sensors can transfer the temperature history for the case of wine through a reader or smartphone to the secure eProvenance online database. Using their NFC mobile phones, consumers will be able to access the eProvenance temperature history, and thus verify the provenance of the wines they purchase. 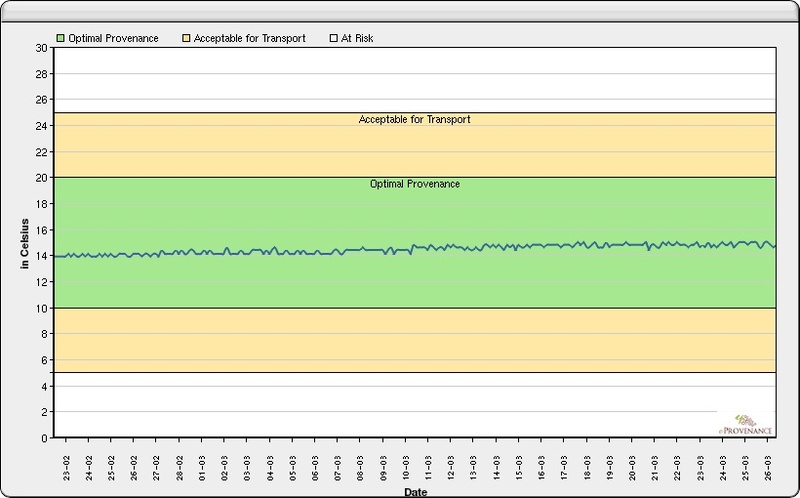 As you can see from the two temperature tracks above, not all wine shipments are treated with the care they deserve (and their buyers probably expect), so the tracking data can be very important. And now data can be collected in the warehouse as well as the shipping container for longer time periods, another way to ascertain quality. With a 15‐year battery life, the new 2G (second generation) eProvenance sensors can be embedded in the wooden wine case to provide continuous, long‐term temperature monitoring, which creates a record of provenance over time that adds to the value of the wine. eProvenance customers can choose either to convert the temperature data into a provenance rating or simply share the data, allowing the importer or customer to make their own judgment about the temperature conditions. Opus One is taking the logical next step in the use of IT, according to the press release from eProvenance — combining story-telling and temperature tracking at the single-bottle level. I’m not sure if Alfred Marshall liked wine, but I’m pretty sure he would like the wine business today for its combination of ordinary and exceptional business practices. 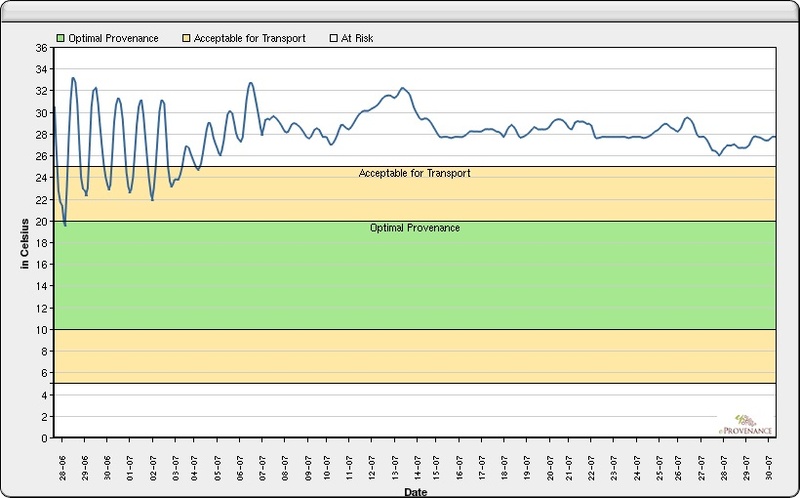 Thanks to eProvenance for giving me permission to use the temperature charts above. Thanks to Ken B. for the suggestion that provoked the “ordinary business” blog posts. I’m always excited to read the final papers written by students in my class on “The Idea of Wine.” The students come from all corners of the university and bring with them a diverse range of skills, interests, and experiences both with wine and with academics and life generally. Reading these papers is never tiring or boring, but that’s probably obvious. To paraphrase Dr. Johnson’s comment about London, a person who is tired of wine is tired of life. As in the past, I’ve picked a handful of papers from the fall semester to feature here. This time I want to focus on two themes: wine science and wine politics. Alex (a Math and Chemistry major) wrote an excellent survey of “Improvements in Wine Making Through Chemistry” that argued that “In every part of the [winemaking] process there are questions that can only be addressed using modern chemical models and knowledge.” He supported this point with several examples of detailed chemical analysis. I suspect Alex was “provoked” to write this excellent paper by the combination of the anti-scientific sentiment of the film Mondovino, which the class watched, and the very pro-science attitude of Biology PhD and Master of Wine Benjamin Lewin’s book Wine Myths and Realities, which we read. Two papers dealt with health issues. Julie (Biochemistry) wrote on “Resveratrol: Potential Health Benefits of Red Wine” while Abby (Exercise Science) analyzed “Moderate Intake and the Risk of CVS: Resveratrol, NO pathways and SIRT1.” Both papers took the conventional wisdom of the French “Red Wine Paradox” and examined it in detail through the lens of scientific papers and studies. I learned so much from these papers and I can’t thank Julie and Abby enough for writing them. Fletcher wrote “Happy Halloween, Enjoy Your Glowing Wine,” an analysis of what I call the “Frankenwine” issue – the application of genetic engineering to wine. As a Business major, Fletcher was naturally interested in consumer attitudes towards GMO products and the marketing implications, but I was impressed with his more technical survey of the application of GMO technology to grapes (to deal with climate change?) and yeasts (such as the ML01 strain, which has been in use since 2003). 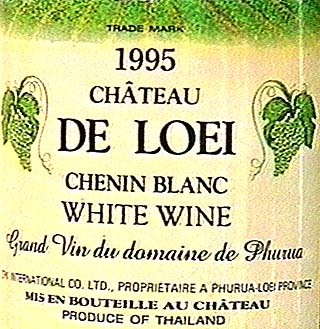 Mike (International Political Economy) wrote about “New Lattitdes” viticulture in “Towards a Tropical Terroir: Winemaking Lessons from Thailand.” Although the Thai wine industry is a work in progress, Mike argued that the technical lessons learned in tropical viticulture might eventually be applied to other parts of the world as climate change progresses. His paper combined science with economics and also politics in his analysis of how the AOC system might make it more difficult for Old World producers to benefit from the technical findings of Thai and Brazilian researchers. Very interesting! Patrick (an International Relations major) wrote “The U.S. Racialized Wine Industry: Can Latinos Break Through?” We know that Latino migrants provide skilled labor in the vineyards – have they been successful in breaking into the cellar, becoming winemakers and winery owners? The answer is yes, but not very often. Patrick examined the structural barriers that seem to stand in the way and speculated about the future . Thanks to all my “Idea of Wine” students for their great work, both during the semester and on the final papers. A note to students who have signed up for the Spring 2012 class: the Fall students have set the bar pretty high! My policy with student papers is that they belong to the students not me, so I do not post them on-line. If you’d like to get a copy, send me an email and I’ll try to put you in touch with the particular students, who may or may not choose to share their work. Jamie Goode and Sam Harrop MW, Authentic Wine: toward natural and sustainable winemaking. University of California Press, 2011. Thus do Goode and Harrop state what I have come to call the Terroirist Manifesto. It is pretty clear, when you put it this way, that our only choice is to take up arms in defense of natural, authentic wine. Going down the other road is unthinkable (and perhaps undrinkable). Let me say up front that I am very sympathetic to the Terroirist Manifesto. Indeed, I argue in Wine Wars that “the revenge of the terroirists” is a necessary feature of the future of wine. We need terroirists to keep us (and our wine) honest. But does it boil down to a simple choice — this way or that way? Despite my stated sympathies, I say no. Wine is not a single thing, it is many things and I think it that monolithic thinking is the wrong approach. Wine travels many roads and I don’t really see the harm if some wines are industrialized so long as that doesn’t stop other wines from taking a more arts and crafts approach. It is up to us, the consumers, to understand the difference so that the wines of the type that Goode and Harrop champion will endure and prosper. So it would seem that I disagree with the authors, but that’s not really true. What makes this a really interesting book (and one that I recommend enthusiastically) is that Goode and Harrop argue strongly for the principle of authentic wine and then carefully instruct on the practical matter of how to get there, focusing on choices in the vineyard, the cellar and the marketplace and taking account the real world differences between high volume commercial products and small lot craft wines. In other words, I think Goode and Harrop are really telling winemakers that they don’t have to make a big choice — wine is not really at a crossroads — because there are practical sensible ways to achieve their goals without debasing the idea of wine as a unique element of society. The key is keep the idea of authenticity in the forefront. So what is authentic wine? Well, even after reading the book I don’t think I can give you a precise definition. This may be by design. 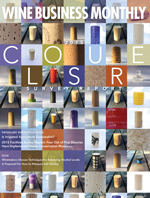 Apparently Goode and Harrop originally wanted to title their book Natural Wine, but then the “natural wine” movement appeared, advocating extremely limited intervention in wine making. Although its advocates argue that this is the only way to make “real wines” (remember the English “real ale” movement of a few years ago), others say that it is just a fad or an excuse for the flawed wines that result from this extreme approach. Goode and Harrop were probably wise to duck this controversy. Although their goals may align pretty well with those of the most vocal natural wine advocates, their strategies and tactics do not. They are far too practical (a good thing in my book) and understand that no one is going to risk making a million gallons on flawed wine because they are wedded to the most extreme versions of the natural wine principle. Goode’s fingerprints are readily recognized on many pages. A scientist, he is also author of The Science of Wine, a book that I have read from cover to cover twice and consult very frequently. The combination of emotional manifesto and reasoned analysis works very well. So what do the authors think of biodynamic wine (the topic of last week’s post)? Biodynamics is an interesting test — a sort of enological shibboleth. You would think that biodynamics would be the ultimate natural wine, but the question is more complicated in practice. Although biodynamic wine is pretty consistent with natural wine practices in the vineyard, I think biodynamic rules actually allow some winemaking practices (sulfites, for example) that the “natural wine” proponents forbid. So biodynamic wine may be authentic, but not natural. Very strange. Goode and Harrop devote an entire chapter to biodynamic viticulture and they offer a very readable summary of the limited academic literature on the subject. The bottom line: there doesn’t seem to be any objective evidence that biodynamics has positive effects that go beyond those available through standard organic viticulture. The cosmic “voodoo” elements may be just that and, the authors warn, they may even have negative impacts to the extent that they divert the focus from organic practices. So biodynamics is a hoax? Well, not so fast, the authors say. The limits of the test studies are examined, as they should be, and then the chapter finishes with a set of profiles of winemakers around the world and their biodynamic biographies (this, interestingly, a thumbnail version of the approach Katherine Cole takes in her book about biodynamics in Oregon, Voodoo Vintners). Maybe it really is doodoo voodoo yoga (as I reported in my last post) after all! Goode and Harrop can’t prove that biodynamics works, but they don’t want to dismiss it. They are sympathetic (as am I) perhaps for philosophic reasons or perhaps it is political — every movement needs a few fundamentalists to keep the party line from straying too far. Authentic Wine: A Fork in the Road? At the end of the day it is pretty hard to argue with the idea of Authentic Wine as presented here. This is partly because Goode and Harrop make such a strong case, but it is also because in “authentic wine” they have created a flexible concept that is narrow when they want it to be and loose when that’s what’s needed — along with a map for consumers and producers to follow so they can enjoy the benefits of authenticity without tears or fears. Go to the fork in the road … and take it! I think it’s a step in the right direction. In case it isn’t clear above, I recommend Authentic Wine enthusiastically. I read it in the galley stage and wrote a “blurb” that you’ll find on the back cover. I saw one critic refer to this as an “academic book” and I suppose it is — it’s published by the University of California Press. But that doesn’t mean that it is tedious and full of charts and graphs. It is actually full of people, which is a great way to tell a story. It is a serious book, but you wouldn’t be reading The Wine Economist if you didn’t already have a serious interest in wine.